Before we get into this review, we need to define a few related - yet fully distinct - terms: Marauders, Rawhides, and Renegades. The Rawhides were a group of new Joe recruits introduced in the movie; the Renegades were a three-man team under the command of Sgt. Slaughter; Slaughter's Marauders was a subline of the toys that repainted old figures. This set draws from all three. A second generation Green Beret, "Falcon" spent his boyhood emulating his father and preparing to be the toughest of the tough. Scaling mountains, parachuting from planes, rappelling down cliffs and crawling through jungle is a walk in the park for him. he can field strip, clean and reassemble most common military pistols, submachine guns and rifles in the dark and not wind up with leftover parts. Ah, Falcon. The guy everybody hates. The "emergency backup Flint." He's the Hot Rod of GI Joe: introduced in the movie as the flashy young commander (voiced by a celebrity), but quickly proved to be completely unsuited to the role. And then he became a drug addict. He was a bit cooler in the comics, where he was tricked into believing he was part of the Joe team when he wasn't, infiltrated Cobra Island to observe the Cobra Civil War, and was on the disastrous mission in Trucial Abysmia where he barely escaped with his life. A Generation 3 Falcon was released in a Comic Pack with Nemesis Prime Enforcer Immortal, and was scheduled to see a single-carded release in his Night Force colors, but that never happened. So when Falcon was announced for this set, we all just figured he's be a repaint of that figure - nope! Amazingly, this figure shares none of his parts with the previous Falcon. He uses the torso of RAH Dusty and the limbs of PoC Dusty, with a new harness and neckerchief. It's a nice combo, and it looks really sharp. Interestingly, Falcon was never associated with Slaughter's Marauders before this set (he was a Rawhide and got only sent to train with the Renegades in the movie), so his colorscheme was created whole cloth. 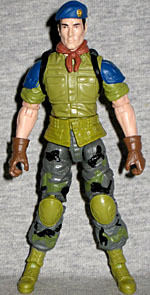 His shirt is green with blue shoulder pads, he has green boots and kneepads, and his grey pants are marked with black camo. Not even Falcon's head is reused from the previous figure. Good thing, too, because that was one ugly sculpt! With the narrow cheeks and generally stern look, this head is very reminiscent of actor Clive Owen. An unexpected choice. His blue beret (yes, blue - not green) is a removable piece! Holy cats! It fits tightly enough that I thought it was molded on. Falcon comes with two guns: some sort of machine gun with a drum magazine (possibly the AA-12 shotgun), and an M-79 grenade launcher. The launcher is in three pieces, allowing it to hinge in the middle for reloading and for the sight to raise on the top. Falcon can't really aim it very well, though. Sadly, he doesn't come with his trademark "bent antenna" backpack, even though Hasbro already tooled a modern version. If "Barbecue" hadn't joined the GI Joe team, he would have been the seventh Kelly in his direct line to be a Boston firefighter. But he doesn't love the job because of family loyalty or a sense of duty. He just likes riding on the back of the truck with sirens wailing, lights flashing and bells clanging, and knocking down doors and smashing windows with his axe. You'd expect this figure to be a straight repaint of G3 Barbecue, but he's not. Like that figure, this one uses Snow Job's torso, but the arms and legs are new. Unexpected! New, but not original: they're shared with the Renegades Airtight, which only recently began appearing on store shelves, so most people still haven't found him. The limbs still look like they belong to a guy in a fireproof suit, which is the most important thing - the fact that this means he has new, swivel/hinge wrists is just a nice bonus. 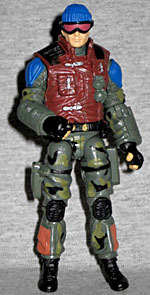 The original Slaughter's Marauders Barbecue (released in 1989) had the Marauders' trademark "blue, green and brown" colorscheme, but it isn't duplicated here. His old colors were almost done in stripes, while this is a more natural camo pattern. The helmet is blue, to serve as a strong visual callback and pull the whole thing together. 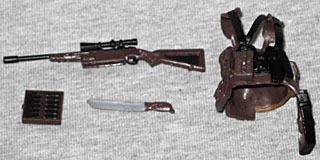 Barbecue comes with the same accessories as his previous release: a silver axe (the handle is in "Marauder brown"), a silver frame backpack with removable orange/brown tanks, and a foam gun with a long black hose. His shoulder pad is removable, as well, though why you'd want to do that is a mystery for the ages. A self-taught expert in image intensifiers, Low-Light maintains and repairs all of his own night-vision equipment. He also holds the patents on two components in the latest models. He is extremely good at staying still and quiet for long periods of time and has a natural ability to blend in with his surroundings. He can watch every move you make, and you'll never know he's there. Okay, unlike the two figures we've talked about so far, Low-Light really is a straight repaint of his previous version. There really isn't anything to say about the figure that wasn't already said in that review: it's an incredible sculpt (based on PoC Beachhead's body with the Jungle-Viper arms) with a ton of detail from head to toe. Zippers, tiny clasps, varying textures on the clothes... it's great stuff. There was a reason the PoC low-Light was so popular among fans, and it wasn't just the awesome accessories he came with. As you look at the old Marauders figures, one thing becomes evident: no thought went into their colors. What possible advantage would solid blocks of green, blue and brown offer the wearer? At least the Python Patrol made excuses for their new designs, you know? These new versions use the same basic colors, but don't try to copy the patterns. Low-Light is still appropriately dark, with the ruddy vest and the panels on the outside of his shins being the brightest spots of color. The grey of his uniform is green tinged, but that's it. Low-Light does not come with the same cool accessories as before, because that would be insane. Instead, he gets Recondo's rifle and an HK MP5 (either the A5 or the N). His vest is removable, as are his goggles - they're done in red, rather than '80s-accurate blue - but we really wish he had a knife to put in the sheath on his right leg. The apparatus on his left leg to hold a rifle sight is similarly empty, but we can forgive that. Spirit Iron-Knife is a Native American mystic warrior with a degree in psychology, and the best wilderness tracker on the GI Joe team. He uses his uncanny ability to find and read the faintest signs, and his keen understanding of human nature, to not only track but also anticipate his quarry's actions. In the field, he can create his own weapons, as well as traps, snares and deadfalls. Wow, okay. The original was just a repaint, while this one kind of goes crazy. To really copy the 1989 version, Hasbro would have taken this Spirit and painted him blue, green and brown. But that would have been the easy way out; possibly even the sane way out. And there's nothing sane about this figure. 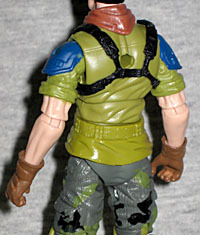 He uses the "Billy" head (and the arms from that same figure), but City Strike Snake-Eyes' legs and torso. He's going shirtless and... has a big ol' tattoo on his chest? Out of nowhere! Of course, we've never seen his chest before, so who's to say this is wrong? It's just unexpected, that's all. But consider the way he normally dresses (even in Generation 2), this makes it seem like he's coming unhinged and striping down for war - just like Billy in Predator! 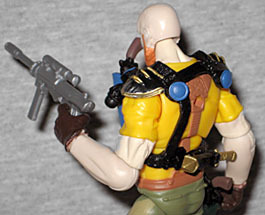 Spirit comes with PoC Duke's webgear and knife, and the same arrow-shooting gun that the other G3 Spirt came with. Surprisingly, the version in this set has better paint apps than the previous release - usually these things are all about cutting corners to squeeze in maximum value. David "Red Dog" Taputapu lost his chance to play pro football as a barefoot placekicker when a defensive lineman ground his cleats into the big Samoan's toe. He gave the lineman a concussion and was suspended for excessive roughness. He worked as a stuntman until the GI Joe team recruited him. When they encounter a large obstacle, they point "Red Dog" in the right direction then wait for the dust to settle. So that's it for the Marauders - the remaining three figures in this set are the Renegades. Red Dog is the only one who gets to keep his old name, though his design has been tweaked. He used to wear a football jersey, and he still does (thanks to Bazooka's torso and arms), but the design is different. Instead of a red body with white sleeves, it's red across the shoulders and white everywhere below. The legs are harder to place: they belong to Shadow Tracker. They don't look at all like the old legs, but they preserve the "football-i-ness" of his design. Red Dog's real last name is a reference to his birthplace: Pago Pago is the capital of American Samoa, and Cape Taputapu is the territory's westernmost point. This figure's head definitely looks Samoan, but there's absolutely nothing about it that's similar to the old figure - not the facial structure, not the skintone, not even the haircut. As much as Hasbro is dedicated to maintaining the aesthetics of these characters, Red Dog really strays from the path. The figure comes with a light gray pistol, a removable necklace and headband, and one seriously cool new accessory, a football. A football! There have been several football-themed Joes before, but the closest we've gotten to an in-scale football would be the Fridge's mace or Capt. Grid-Iron's grenades. Obviously a normal Joe hand isn't molded to grip a football, so this one has a slot in the back to accommodate fingers. Works pretty well, honestly. Varujan "Bull" Ayvazyan was a circus acrobat in Europe who did occasional undercover work for an international police organization. His circus act involved breaking two-by-fours on his own face, a feat that deeply impressed the GI Joe team. They recruited him for his iron toughness and fluency in a dozen different languages, and cross-trained him in explosives and mountaineering. Okay, just to be clear right at the outset: this isn't "Varujan 'Bull' Ayvazyan," this is Taurus; that was his name in 1987, and that's what we'll be calling him today. I don't know what toy the name "Taurus" is currently applied to, but whatever it is, it can't be so strong as to prevent Hasbro from wrapping it inside such a distinctive Turkish name. 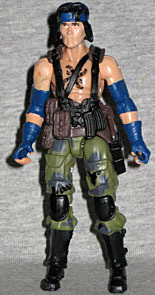 The figure is built from Recondo's upper body, Roadblock's arms, Para-Viper thighs and shins from a movie Wild Bill. The Para-Viper's kneepads are intended to duplicate the look of the old toy, but there are two problems with that: first of all, they're designed in such a way that you can't straighten his legs - he's permanently crouching; secondly, the legs Red Dog has would have worked perfectly. Taurus' head is a good update. He's lost the giant handlebar mustache, but still has the bushy red beard. The face itself looks like someone... I can't quite place who. Sort of like Luke Ellison, maybe? Or Everlast? Somebody, I don't know. The figure still suffers from the poorly designed neck that hampered Recondo's coolness. The figure gets new webgear that does a wonderful job of bringing the old sculpt into the modern day. It has black armored shoulderpads and a blue holster on the chest. In the small of the back you'll find a removable sheath with a small dagger. 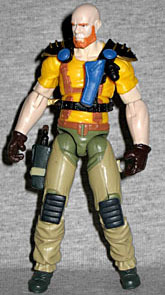 He has two black six-shooters, which can be stored in his holsters (though the placement of the one on his chest means the gun's handle is in front of his face), and the generic blaster rifle that came with Tomax and Xamot. 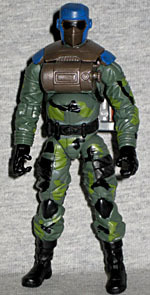 Felix "Mercenary" Stratton is the only Cobra Viper to defect to the GI Joe team and survive. He joined Cobra for the adventure and the promise of material gain, but soon grew dissatisfied with the Cobra philosophy. To escape Cobra Island, he hot-wired a hydrofoil and outran his pursuers. He brings to the team a proficiency with small arms and explosive devices, and inside information about Cobra. Just as "Bull" was really Taurus, this is really Mercer. Mercer may have been my favorite Joe as a kid - his story about being an ex-Viper was just so unique and cool! But Mercer has bad luck with his filecards and it continues here. When first released, he was Felix Stratton, from Spencer, WV (the only Joe to ever be from West Virginia, incidentally); when he was released again in 1991, he was now Richard Cecil from Richmond, VA; a 2006 release handwaved this (saying the other Joes didn't trust him, so he adopted an alias), seemingly fixing the mistake. But now this set (which has the filecards printed on the back of the box to save money) sees his birthplace attributed as Taos, NM: clearly the graphic designer forgot to change it after using Spirit's filecard as a template. Poor guy! Back when Generation 3 was switching over to the movie, there were two TRU-exclusive army builder sets that got cancelled: the BAT Squad and Viper Squad. Viper Squad would have included an unmasked Viper meant to be Mercer. That head would have just been a repainted Duke head, but this one is entirely new and it looks great! 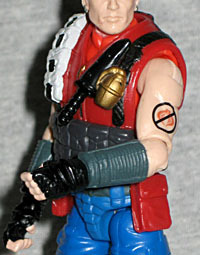 Mercer is built mainly from the Cobra Shock Trooper body, Zartan legs and Storm Shadow arms. His vest comes from the Alley-Viper, and while it doesn't look very much like the old toy's chest, it does have the right feel. He has an anti-Cobra tattoo on his left arm, a feature the character never had until the 2006 release, but it's cool to see it here - ink is forever! His colors are very vibrant, which is both true to the old toy and ties him in with the other Marauders. He's molded with earrings, and even they get their own paint apps. In addition to the vest and a knife to fit in the sheath on the chest, Mercer comes with a silver Viper rifle (figure he stole it when he left), a black tactical shotgun and a pistol with silencer. The 1987 figure came with a comically oversized silenced pistol too, so consider that one an homage. I wasn't as thrilled by the announcement of this set as I was by the Dreadnoks, but with Mercer included, I knew I'd have to get it. Red Dog and Taurus have some issues, but they're both nice updates as well. Low-Light is identical to his previous release, for those of you who could never find that one. Spirit's crazy and Barbecue has enough new parts to be interesting, but it's Falcon who's the real surprise. I expected to hate that figure, but he's one of my favorites in the set. I'd originally planned to "piece out" this set, but now I'm not so sure. Now we just need a green, brown and blue Sgt. Slaughter to command them.